Adjustable. Recipe for size calculations is given and pattern for women/children size is given. 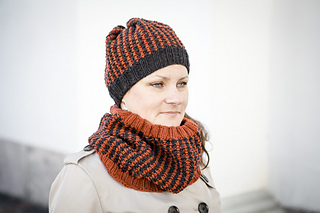 Warm and easy stitch pattern, in which you are using only one color per row. No stranding in back of the work. The stitch pattern is quite easy also for beginners. 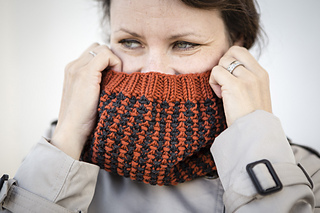 The Cowl size is highly adjustable, choose your own size and work with the recipe. Detailed formula of calculations is given AND pattern of women/children size is given. 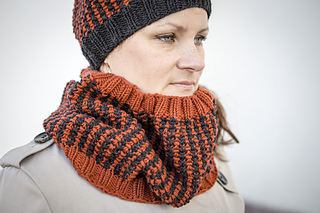 This pattern is only available in Eagle Fern Set eBook. The eBook includes, in addition to Cowl, Eagle Fern Beanie and/or Eagle Fern Bonnet and Eagle Fern Mittens. Lämmin ja helppo mallineule, jossa käytetään vain yhtä väriä kerroksella. Ei langanjuoksuja työn nurjalla puolella. Ohje on saatavilla vain e-kirjassa, joka sisältää myös pipon, korvaläppäpipon ja lapasten ohjeen. Kaulurin koko on helposti säädettävissä. Schachenmayr nomotta Extra Merino Big, 100% Merino, 50g/87yds/80m AND Lane Cervinia le fibre nobili Mambo, 100% Merino, 50g/87yds /80m; You need approx. 2 skeins of MC and 2 skeins of CC.